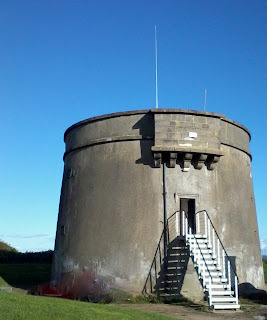 On a hill in Howth resides the Hurdy Gurdy Museum of Vintage Radio in the historic setting of Martello tower no. 2. 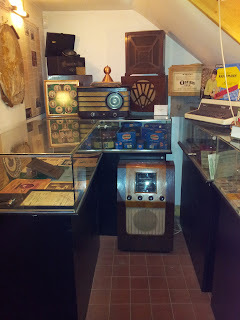 Since 2002 Pat Herbert, the curator, has housed all manner of artefacts, relating to Marconi and the history of communication. Various constraints meant that the museum's catalogue remained undeveloped, until this year. So when looking to jump into a cataloguing project, choosing the Hurdy Gurdy was not a difficult decision. The criteria? A greenfield in terms of cataloguing, a rich collection and an agreeable management team. Evaluating the IT infrastructure within the tower, it was apparent that a local server solution was not feasible. In order to promote the museum’s collection an online public catalogue would be preferable. Financially speaking open source was the only option, and so Omeka.net ticked all these boxes. Omeka.net was constructed for museums to archive their artefacts in the cloud. Functionalities such as exhibiting collections online and Google analytic plug-ins made the site attractive. Dublin Core metadata is the primary descriptive method on Omeka. Visually attractive, Omeka would allow the team at the Hurdy Gurdy to exhibit online their various collections in an effective and informative manner. Dublin Core suited our collection considering the wide variety of objects in the museum. There are a number of specific collections within the museum, such as radios, valves, household products and historical documents from the foundation of the Irish state amongst items relating to the history of telecommunications. With the upcoming anniversaries relating to the foundation of the Irish state such as 1913 lockout, 1916 Easter Rising, 1919 War of Independence and the 1922 Civil War, we recognised that certain areas of the collection would generate interest. As we became more familiar with the various aspects of the collection, we began to formulate a cataloguing policy. As we began to virtually classify items, the activity surrounding this allowed us to re-evaluate the exhibits within the museums physical space. Fuelled by tea, Wagonwheels® and a love of all things vintage, we classified items within specific collections on Omeka. As the catalogue took shape online, we began to construct mirrored collections within the museum itself, areas such as a valve corner, an Irish history space and an Ever Ready® dry battery display. This has only enhanced what is already a splendid collection of radios, valves, artefacts and batteries, this is an untapped treasure trove of historical items within the Howth environs. So far a thoroughly rewarding endeavour and will hopefully continue to be so. Great project, Sarah & Marie-Therese - an example of the very real difference that cataloguing can make in opening up & increasing the visibility of a collection.